Residents at Koronis Manor celebrated the marriages of 11 couples in June. Five of the couples have been married more than half a century. Viola Olmscheid recently had an occasion to wear her wedding veil again, 54 years after her marriage. Her dress was on display to be admired by 11 other brides also remembering their wedding days. Viola and her husband, Leo, are one of eleven married couples with at least one spouse currently living in the Koronis Manor in Paynesville. 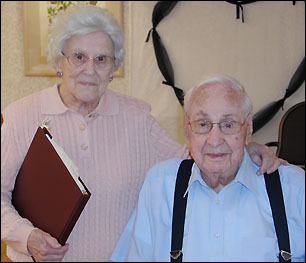 A celebration of their marriages was held at the nursing home in June. People in long-term care are typically prevented from attending festive events, because of limitations due to wheelchairs or other medical needs, said activities director Kathleen Block. She explained that the nursing home celebrates with residents to recognize that residents "keep on living, keep on growing, and keep on making memories." Residents at Koronis Manor celebrated the marriages of 11 couples in June. Lloyd and Joan McMillian, married 12 years, are the newest couple, while three couples have been together at least 60 years. This event has been held in the past, most recently three years ago, but this year the number of couples made the group unusual. Having 11 couples healthy enough to attend such a celebration is rare in long-term care, according to Block. It is the second marriage of at least one spouse for five of the couples. The couple with the longest marriage, 62 years, have been husband and wife a half century longer than the couple with the shortest, 12 years. Five of the couples have been married more than 50 years, and three additional couples are celebrating at least 30 years of marriage. While sharing memories, the couples reflected on changes in marriage traditions, such as honeymoons. Annette Benson never had a honeymoon with her husband, Russ, when they were married 60 years ago. With a good-natured laugh, she explained, "my parents went on our honeymoon, and we stayed home and did chores." Leo recalled his honeymoon with Viola, when they spent one night in Duluth, drove home, and milked cows the next day. George and Rose Kortan - who were married more recently, only 13 years ago - had a longer honeymoon. They spent a month traveling 5,000 miles across Canada before they had to get back to celebrate another marriage, this one for George's daughter. Couples were engaged in sharing memories through much of the event, held on Wednesday, June 8. The Kortans laughed as they remembered a sign they had made for their wedding. It said "excuse us, please," and they held it up to kiss behind at their reception. Though they did not know each other at the time, the newest pair, Lloyd and Joan McMillian, who have been married 12 years, retired on the very same day. Since their marriage, they have traveled together - they fondly remember a trip to the Panama Canal - and have played a lot of cards, sharing those games they had learned before meeting. In addition to Viola's dress and veil, there were dresses from many of the staff members displayed, showing different styles through the decades. Wedding pictures, decorations, and cake made the occasion festive as the couples reminisced about their time together.